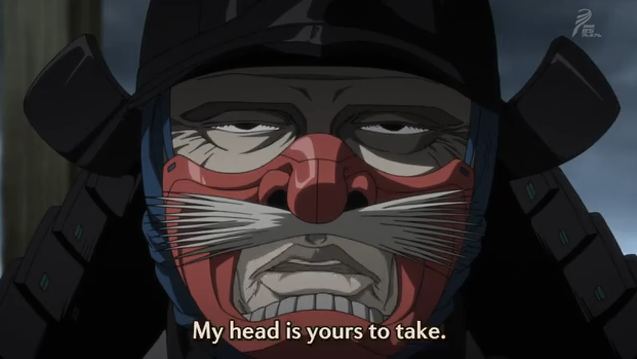 General Hashiba, AKA the "bald rodent". It has been several weeks since our last look at the world of Hyouge Mono (Tea for Universe, Tea for Life). Those readers who, as I, frequent Psgels’ Star Crossed Anime Review, know that week after week, Psgels has rated the new episode of Hyouge Mono “excellent”, and placed it amongst his featured “Top 3 Episodes of the Week”. Meanwhile, those of us who lack the ability to understand untranslated Japanese, have been waiting for a new release by the fan-subbers. Episode 5 continues to develop two issues raised in episode 4, the relationship between Master Senno and General Hashiba, and the three tea urns, possession of which confers the ability to rule all of Japan. 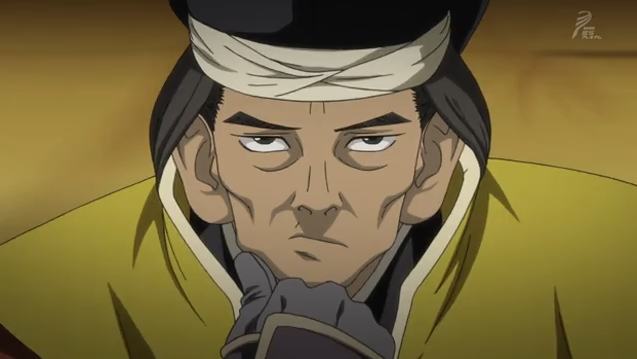 The tea master Sen no Soueki (AKA Senno), in disguise. Of primary dramatic importance, we see the continued discussions of Master Senno and General Hashiba, as well as Hashiba’s first machinations to bring this treasonous partnership into being. It is worth noting that Senno and Hashiba consider what they are doing as being treasonous. Senno meets Hashiba under a ruse (disguised as a samurai warrior), and Hashiba ensures that the visit is secret by killing his own men. 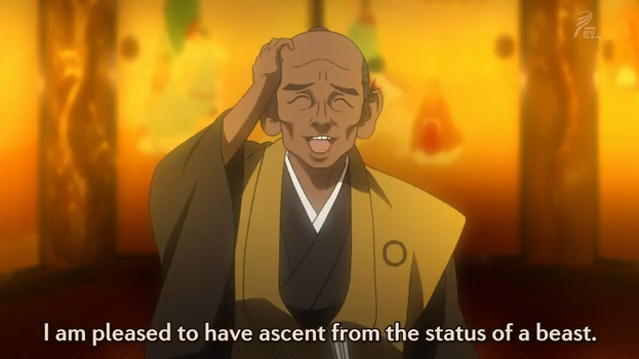 This brings me to one of the fascinating aspects of this episode, General Hashiba’s many faces. Unlike Furuta Sasuke, Hashiba’s many faces are not entertainingly revealing of his true feelings. Hashiba only pretends to reveal what is in his heart. General Hashiba deep in thought. 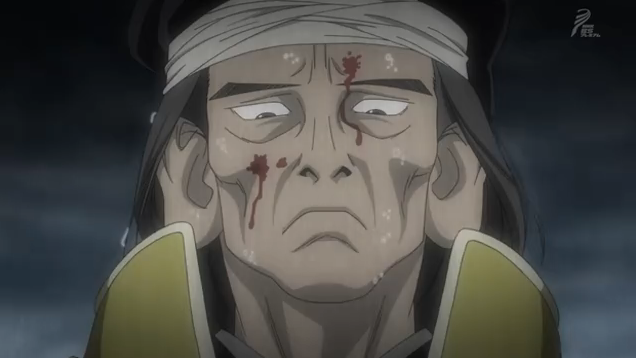 Hashiba spattered with the blood of his own men. 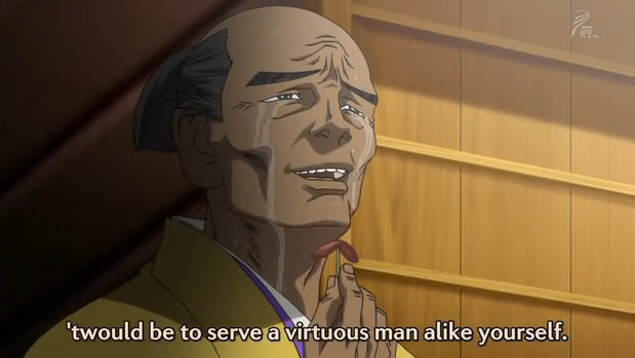 Hashiba, ingratiating himself before Lord Oda Nobunaga. Hashiba trying to convince General Akechi that he wishes Akechi were the ruler of Japan. I was suspicious of Hashiba from his duplicity in episode one, and this episode really showed how he not only was ambitious as hell, but that he would do anything to act on that ambition. Even the way Hashiba is shown handling Sasuke is revealing. He knows that Master Senno has arrived, and tells Sasuke that he can take some time to chat with his brother-in-law, Takayama, which will keep Sasuke from discovering the arrival of the tea master. Hashiba’s ambition is clearly one of the driving forces of the early part of our story. Another seems to be the power of three tea jars. 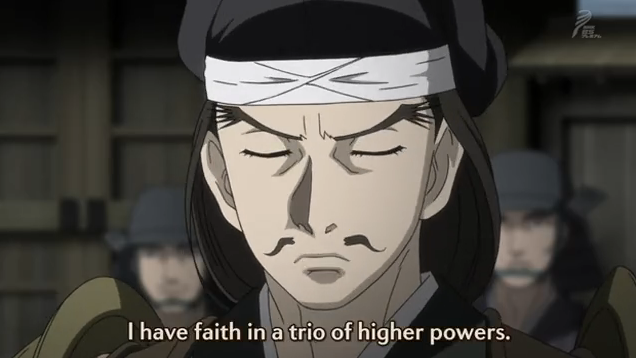 Furuta Sasuke, he believes in the power of three legendary tea jars. Exactly what role the Nitta, Hatsuhana, and Narashiba tea jars will play is still unclear, although the Narashiba, being the one tea jar not yet in Lord Nobunaga’s possession will probably be featured. Beyond this, Sasuke’s own selfish desires, including his greedy desire to possess treasures of aesthetic delight is a bit of a wild card. Sasuke’s indulgence may have some unknown effect on Hashiba’s designs, or it could be the thing that ensnares him in Hashiba’s plot. Regardless, it was wonderful to see this show is still getting subbed, even if slowly. I very much look forward to the next episode. Oh, and it looks like Mushy has picked up this series as well, so make sure to check out his coverage. I just thought of a very interesting idea, that will definitely not occur – what if the main character changes in the next cour? It would definitely be interesting to see these shenanigans from a non-aesthete/non-military point of view. Perhaps a farmer, or samurai, or peasant, or even that Christian guy. It would definitely make for a far more dramatic ending. Also, I really hope some other ‘major’ subbers will pick this show up next season – it’s the underdog of the year! Absolutely agree on “underdog of the year”. This is a three corse show, so they could even do several of your ideas. I doubt they will, though. 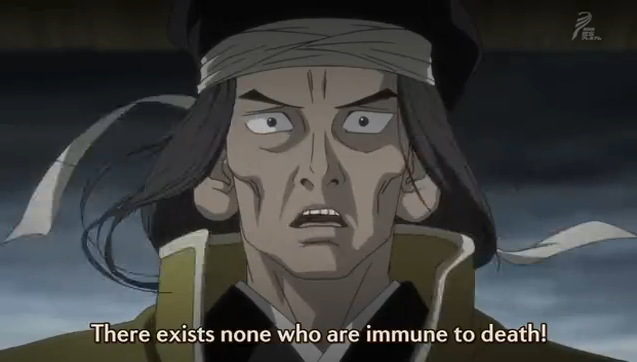 I think the idea is to take the viewer up through the first Tokugawa shogun, Ieyasu (although that is a guess). Without meaning any disrespect to the fansub group doing this show (thanks), I secretly wish that gg would sub this show. At least then a lot of people would give the show a try. It is a shame that it is not being watched, and you are right, I think, in saying another subber would help get the show an audience. Hopefully the popularity will build as the number of episodes available increases.